I didn’t try any kind of cream or lotion for my little one until her 5th month. My mom used to apply coconut milk mixed with turmeric before taking her bath. Her skin was soft and smooth at that time. Suddenly, things changed when we entered the winter season. She got rashes on her cheeks and legs, that turned her skin itchy and reddish. Even my mom tried using milk cream, curd, and aloe vera extract but nothing worked perfectly. I had no other way than consulting a pediatrician. She recommended using Curatio Atogla cream which worked like a charm on my baby’s skin. Applying 2-3 times a day eventually reduced the dryness and itching on her skin. I was personally against all kind of baby skin care products, but this experience changed my mindset completely. Now I know the importance of baby skin care products and how it should be carefully selected from the market without harming my baby’s delicate skin. Baby lotions usually preferred on normal skin types. But when your baby skin is extremely dry or sensitive, you need to go for baby creams because creams are thicker in consistency and it makes a firm protective coat on your baby’s delicate skin. Before selecting a random cream or lotion for your little one from the marketplace, you should check the following important criterions which define the quality of the product. pH of the skin care product is an important factor while you select either baby lotion or a baby cream. The pH of skin is 4.5, called as acid mantle which acts as a protective layer on the baby skin. So, it is important to select a baby skin care product of pH close to the acid mantle, so that it won’t disturb the protective layer of baby skin. Here is a list of best baby lotions and creams categorized based on the baby skin type, age, and climate. Sebamed Baby Cream Extra Soft with pH 5.5 is a perfect choice for babies with atopic dermatitis, also called as atopic eczema (results itchy, red, swollen, and cracked skin). It soothes baby’s sensitive skin. Best to use on cheeks as well as high-stress areas like elbow, knees, and legs. Its ingredients are 42% natural lipids (lipids are the skin’s natural fats – it act as the skin’s protective barrier, help in the skin’s natural repair process, and minimize the epidermal water loss), Panthenol (skin conditioning), Allantoin (FDA approved drug, heal wounds and skin irritations), and chamomile extracts (soothe and regenerate baby’s skin). It is recommended to get a piece of advice from a pediatrician before using on baby’s atopic skin. Rich in panthenol, allantoin and chamomile extract, the moisturizing and protective complex soothes and regenerates the irritated skin. Himalaya Baby cream is aimed to protect your baby’s dry cheeks, tender noses, rubbed elbows and crawler’s knees. A major portion of this baby cream’s ingredients are herbal which is always good for your baby’s tender skin. Ingredients include Olive oil (soothes the skin), Country Mallow (protect the baby skin from germs) and Licorice (reducing redness, make the skin brighter). Available in 3 different sizes. 50 ml, 100 ml, and 200 ml packs. It may not be that good for oily skin. If you are looking for a baby face and skin cream which can be used in winter and extremely dry skin conditions, Curatio Atogla would be a great choice. Atogla Baby cream acts as a good moisturizer, treats rashes and itchiness, leaves a soft and soothed skin. It has a special blend of Ceramide, Cholesterol, and GLA which reduces water loss from the skin thus making your baby skin soft and supple. It has a mild good fragrance which keeps your baby feel fresh and pleasant. Pigeon Baby Cream is enriched with olive, rosehip and chamomile extracts. It is hypoallergenic, paraben free, pH balanced and dermatologically tested, which makes the cream perfect choice for newborn babies of dry and sensitive skin. This baby cream is fragrance-free and it is free from synthetic colors which reduces the chances of skin allergies for babies. This is a good moisturizer with a medium texture that serves both as a face cream and a body lotion for babies. Mamaearth milky soft baby face cream prevents rashes on your baby facial skin and helps in keeping it soft and moisturized. Applying on a regular basis improves the skin texture and turn the baby’s face bright and glowing. This baby face cream made up of a great composition of milk protein and murumuru butter (obtained from the seeds of the murumuru palm tree – high content of deeply moisturizing oleic acid) along with shea butter, Cocoa Butter, Sesame Oil, Almond oil, Glycerine, Olive oil, Lavender Oil and Chamomile Oil. It is free of mineral oil, petroleum, paraben, synthetic perfumes, and artificial preservatives. There are complaints of a package, chances to break the tube nozzle while shipping. Most of the times when I received MamaEarth products, its unsealed, leaked. SKIN PROTECTANT MOISTURIZER - Mamaearth's daily facial moisturizer baby cream specially formulated with care for the delicate and soft sensitive skin of babies. It soothes and intensely moisturizes baby's itchy, extra dry skin. DOUBLE OAT - Oat has an ability to absorb moisture and relieve dry, itchy, irritated skin. Oat oil and Oat flour locks in moisture relieving dry or irritated skin. FOR DRY, CHAPPED OR IRRITATED SKIN - Formulated with Oat oil, Oat flour alongwith Milk Protein and Lavender oil can act as an skin proctectant. It maintains natural skin protective barrier and keeps baby's skin soft, smooth, and healthy. SAFE FOR BABIES - All ingredients used are natural and free of toxicity and irritants. They are gentle and totally safe on baby's sensitive skin. The goodness of shea butter and Vitamin E itself makes the Chicco Natural Sensation Face Cream perfect fit for your baby’s delicate facial skin, protecting it from weather changes and contact dermatitis (skin reaction while in contact with irritants like saliva or milk residue). Shea butter helps to regenerate the skin and Vitamin E restores lost moisture, thereby it works well on dry, damaged and sensitive skin. It calmly raises the natural glow on the face skin. It is non-greasy and gets absorbed quickly. Aveeno baby lotion is made up of a composition of active natural oat extract (extracted from oats kernel) blended with 5 vital elements (proteins, lipids, enzymes, vitamins, and antioxidants) provides a soothing effect while deeply nourishing delicate baby skin. As a skin protectant active ingredient, oatmeal can help restore skin’s normal pH and help to maintain the skin’s moisture barrier. This baby lotion is fragrance-free, hypoallergenic, thereby a good choice for newborn babies with sensitive skins. It has a non-greasy, non-sticky formula absorbs quickly, moisturizes whole day, contains no drying alcohols and won’t clog pores. The tube packaging is quite good, the cap shuts firmly, a travel-friendly packing. Natural colloidal oatmeal helps to soothe baby’s dry skin. Oats is a dermatologist recommended ingredient. Mee Mee moisturizing baby lotion is prepared from chamomile extract and olive fruit oils. The presence of chamomile extract gently prevents the skin from dryness and it acts as a natural eczema remedy. Due to its thick consistency, Mee Mee baby lotion is a good choice in the winter season in order to prevent your baby’s sensitive skin from dryness and rashes. Though it labeled as baby lotion, it has a consistency equals a baby cream. Someone may find it as a drawback while piercing the tube, not so easy to get it out. Life & Pursuits – Certified Organic Ayurveda Face & Body Baby Lotion is a unique blend of extra-virgin, cold-pressed, pure natural, certified organic oils, and medicinal Ayurveda herbs. The goodness of Aloe Vera gel gently moisturizes the sensitive skin of infants and toddlers. This organic baby lotion nourishes, soothes and softens the baby skin. It leaves no greasy after-effect. It is advised to use on a daily basis on all weather conditions, though works great on summer season. Not actually recommended for winter. This Life & Pursuits baby lotion is free from mineral oil, synthetic fragrance, colors, parabens, and toxic chemicals. Though mentioned as an all-weather product, it is not good for acute winter season. Organic Calendula (extracted from marigold flowers), one of the main ingredient of Cetaphil Baby Daily Lotion act as a great moisturizing and soothing agent which reduces the dry skin, eczema and diaper rash on your baby’s delicate skin. Sweet Almond Oil and Sunflower Oil soften and smoothen the baby skin. Cetaphil Baby Daily Lotion is dermatologically tested and recommended by pediatricians. It is paraben free, colorant free and hypoallergenic. 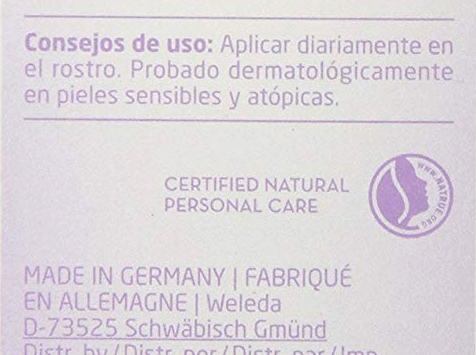 This Made in Germany, Weleda White Mallow Face Cream has been specifically developed to calm dry or irritated skin. It is made up of 97% organic ingredients to relieve the baby skin from itching. The main ingredient – White Mallow, is a soft, warm plant which offers a holistic effect on the nerve system of the skin’s epidermis and excellent for protecting hypersensitive skin. Other ingredients are pansy, sweet almond, beeswax, and coconut. It is always a good practice to do patch up test (checking the safety of the product) before applying any kind of skin care products to your baby’s delicate skin, which can avoid harmful reactions to your little one’s gentle skin. To do the patch test, dab a little amount of moisturizer or cream on the back side of your baby’s palm and see if it’s good with your child skin. If you see any type of rashes then avoid using that cream or lotion. This list of baby creams and lotions definitely give you an idea of the best available products in the market. Though it is advisable to apply on your baby’s skin with the recommendation of a dermatologist or pediatrician. Also, avoid using too much cream or lotion on your baby’s face in the initial 3-4 months as baby’s skin is too delicate. Great List, I have been recently using Seba med Body milk and quite loved it too.